StumbleUpon, a startup recently snapped up by eBay, lets you tag sites you think friends should check out, and will recommend sites to you based on what other users have tagged in your areas' interests. 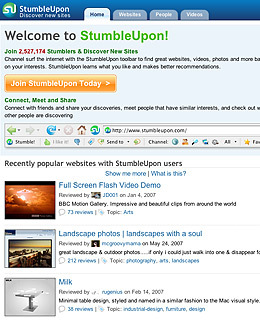 When you register to download the StumbleUpon program, you get a handy toolbar for your Web browser. It includes Thumbs Up/Thumbs down buttons, and a "Send To" button you can click to email a link to a friend. When you're in the mood for something new, click the "Channel" button; like a channel-changer, it immediately takes you to a new site, one it figures you might like. When we tried it, many of the sites it pushed to us were pleasant surprises, and made sense based on the topics we selected at sign-up: photography, music and movies, to name a few. As for the site that showed a photo of a small rodent clutching a miniature machine gun, we suppose that one qualified as "Humor." With nearly 2.5 million Stumblers already feeding the network, the fun, we suspect, never ends. Google also offers its own website recommendation tool, represented by a dice icon that, when clicked, takes you to a site Google thinks you'll like based on your past searches. You'll need the Google Toolbar to get that one.